What are 'flat feet' in children and are they something to worry about? This is part of our series on kids' health. Read the other articles in our series here. Children with flat feet, also called pes planus, have a flattening of the arch during standing and walking. Flat foot is normal in infants and young children (up to 44% of three- to six-year-olds). At this age, in the absence of any associated symptoms, treatment is highly debatable. 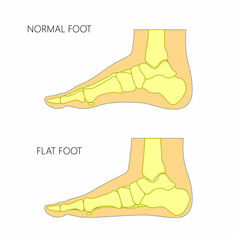 Flat foot usually naturally corrects itself as muscles strengthen and soft tissues stiffen. The height of the arch in the foot increases with age until about nine years. 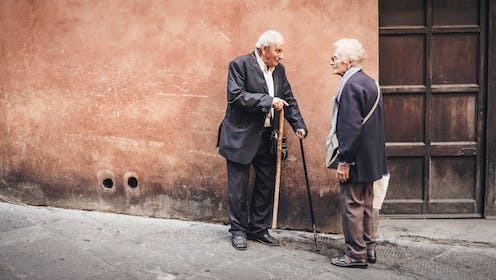 The problem is when flat foot persists, spontaneously occurs in older children or later in life, or is associated with pain and disability. Flat feet can be flexible or rigid, painful or painless and associated with a tightness of the calf muscles (Achilles tendon). The majority of flat feet are painless, but when pain is present it is usually during weight-bearing activities such as walking and running. The pain can be in the sole of the foot, the ankle, or non-specific pain all around the foot area. A complex and sophisticated interaction of bones, ligaments, muscles and nerves within and above the foot defines its anatomy and function. Anything that interrupts the integrity of these structures leading to a collapsed arch can cause symptomatic flat feet. Examination of the foot begins with an examination of the entire child, because the flat foot may have an underlying cause. 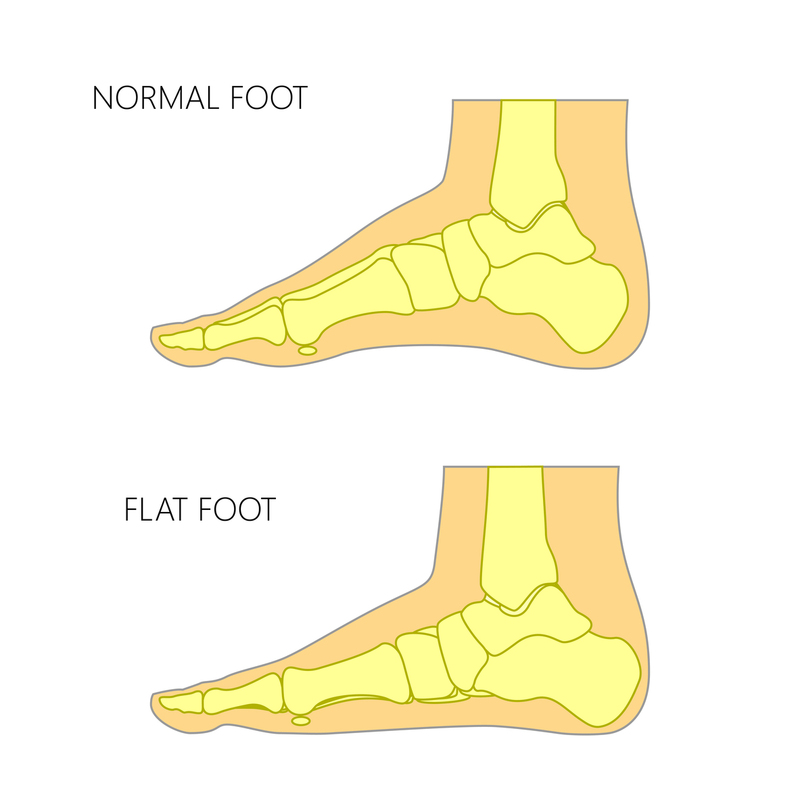 Common disorders causing symptomatic flat foot include: cerebral palsy, some forms of muscular dystrophy, juvenile arthritis, inherited disorders affecting the nervous system, and someconnective tissuedisorders. Flat foot can also originate from unusual anatomy such as a tarsal coalition (bones joined together), ligament or muscle damage, restricted ankle movement, outward rotated lower legs, and knock knees (where the legs bow inwards at the knee). Obesity can result in collapse of the arches by the increased load on the foot. If knock knees also develop, the middle of the foot will tend to turn out (abduct). The foot will point outwards when walking, instead of straight ahead, which is inefficient and can cause early fatigue. Footwear in early childhood has been thought to cause flat foot. Recent research questions this theory, as populations that habitually walk barefoot have flatter arches than populations that wear shoes. It is likely that children who wear shoes, are not physically active and have flat feet will have decreased muscle activation in their feet and thus impaired foot function and weakness. Some older children and adolescents develop flat feet in the absence of any disorder or associated factors. Understanding the role of the small foot muscles in stabilising the arch and promoting normal function of the foot and entire lower extremity might hold the answer. Does flat foot need to be treated? Treatment of flat foot is subject to great controversy. Reaching an agreement between health-care providers on how we should define and classify a flat foot is difficult. Consequently, evidence from the published research is too limited to draw definitive conclusions about treatments for children’s flat feet. A recent review of studies found limited evidence to justify non-surgical treatments for flat foot. 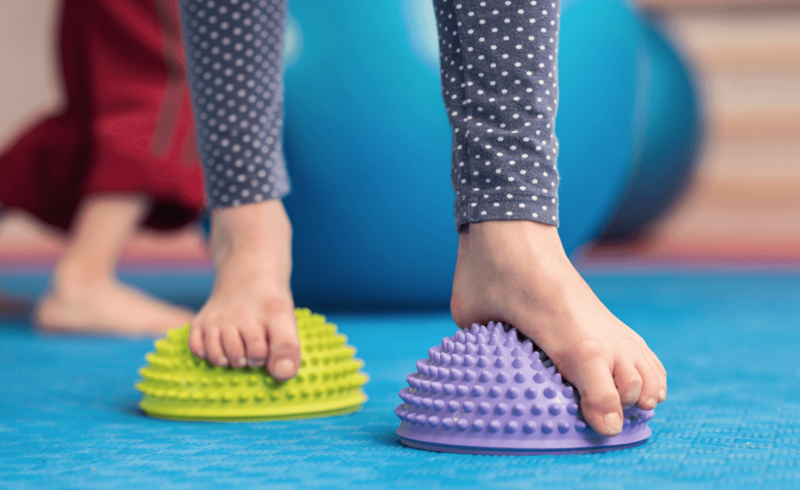 If flat foot is observed in a child who is overweight and has knock knees, or in a child with excess joint flexibility and poor footwear, each of these factors could be contributing to the symptoms, and each should be addressed. If a child’s quality of life is affected by how their feet look, feel or function, then the associated issues should be addressed. Joshua Burns receives funding from: NHMRC (National Health and Medical Research Council of Australia, Centre of Research Excellence #1031893, European Union Collaborative Research Scheme #1055131), NIH (Inherited Neuropathies Consortium RDCRC #U54NS065712 supported by NINDS/ORDR and NCATS), Muscular Dystrophy Association, CMT Association of Australia, Multiple Sclerosis Research Australia, Sydney Southeast Asia Centre, New Zealand Neuromuscular Research Foundation Trust, Thyne Reid Foundation, Elizabeth Lottie May Rosenthal Bone Bequest. David Little receives funding from: NHMRC (National Health and Medical Research Council of Australia, Project Grants #1106982 and #1066357), Australian Orthopaedic Association Research Foundation, NF Clinical Trials Consortium, Elizabeth Lottie May Rosenthal Bone Bequest. He is a paid consultant for Orthopediatrics. In the past he has received research support from Novartis Pharma, Amgen, Celgene, and N8 Medical. Polina Martinkevich does not work for, consult, own shares in or receive funding from any company or organization that would benefit from this article, and has disclosed no relevant affiliations beyond the academic appointment above.